Last night on two separate occasions when negotiating traffic in Rolle I almost hit pedestrians on crossings. Had I made contact it would have been the first time in over fifty years of driving I that have come close to an accident. The crossings were yellow and unlit so were very difficult to see, it was dark and the road was wet. To make matters worse, both of my potential victims were wearing black. It’s odd that in a country that has thought of just about every possible eventuality that might befall its citizens, to the point of providing them with special bunkers in case of a nuclear attack, that the simple pedestrian crossing has been overlooked. Many pedestrians cross without looking, they simply plunge forth. Also many go into sloth mode as they cross. According to statistics, on average one person is killed and nine badly hurt on crossings every week. A recent report stated that 60% of accidents in Zurich between pedestrians and traffic occurred on pedestrian crossings. With statistics like that it might be better not to use pedestrian crossings, however if you cross the road within fifty metres of a crossing you can be fined. 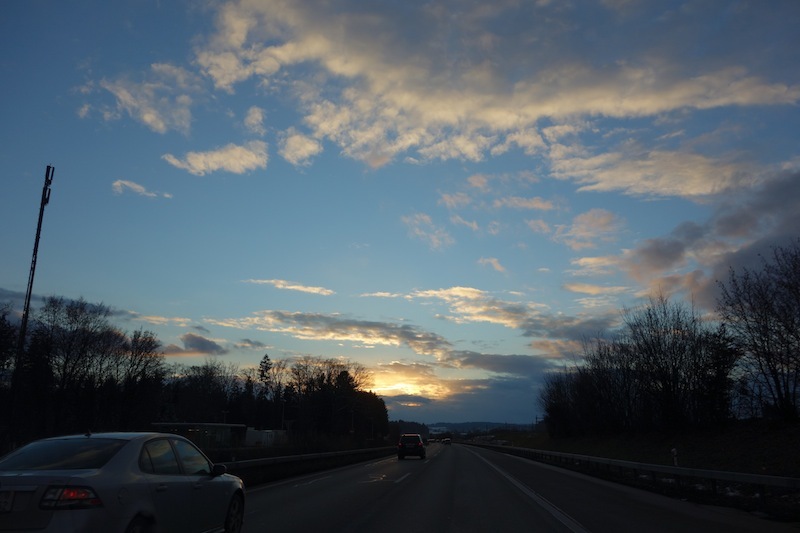 On the road early today (5.30am) as we wanted to beat the peak hour traffic to Lausanne but to our surprise the road north was crammed full with speeding cars and trucks, obviously anxious to get to get to work before peak hour. Not only did the pace of the traffic daunt us but also the road was generally badly lit and lacked ‘cat’s eyes’ defining lane and road edges. No ‘cat’s eyes’ on the road to Bern. The city of Bern (the federal capital of Switzerland) has it all, and because we have made it one of our Swiss bases we have managed to see more of it than most. 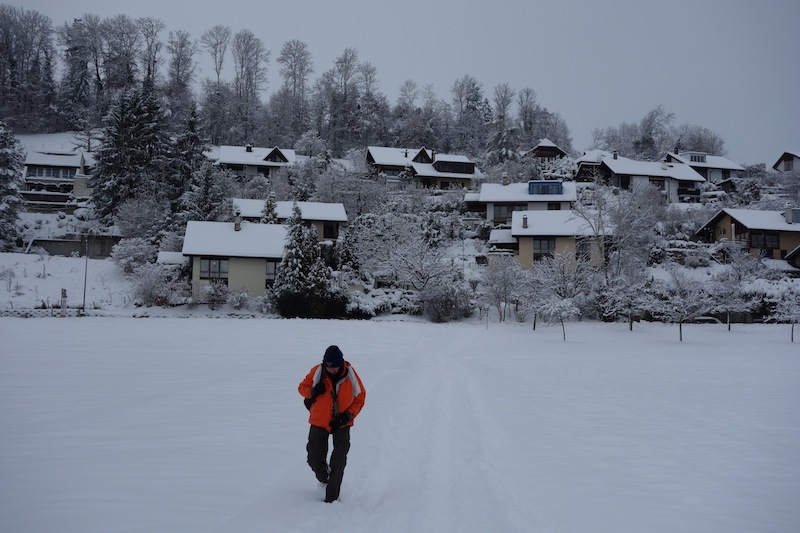 The following photo gallery shows a number of discoveries we made and some of the activities we were fortunate enough to experience in and around Bern. 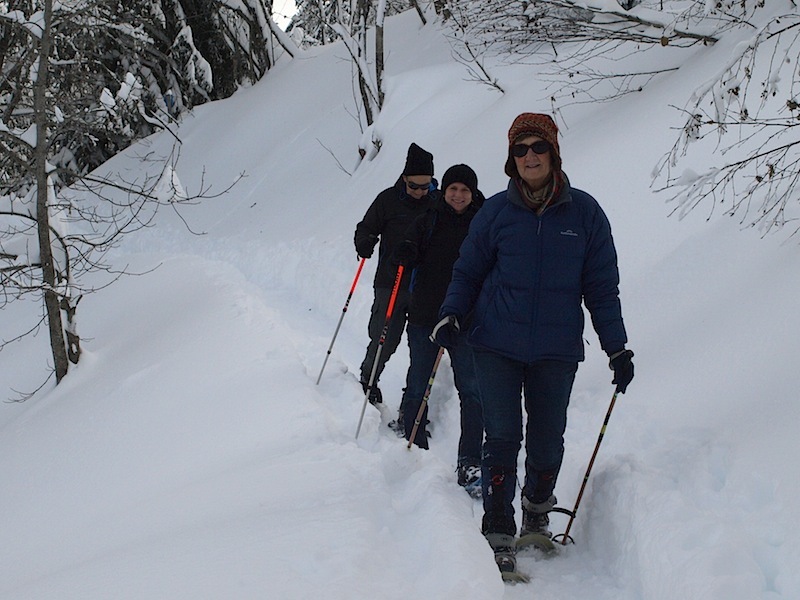 SNOWSHOEING in the MOUNTAINS near BERN. 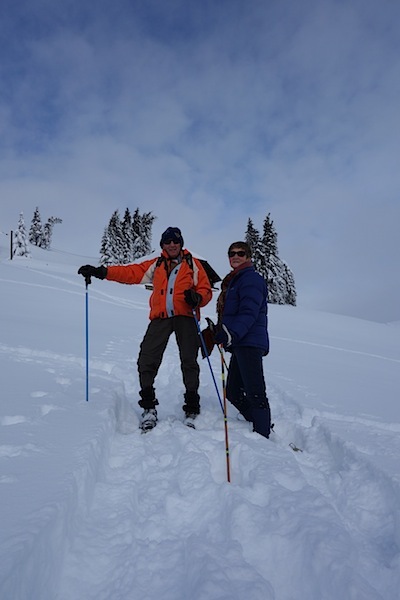 No longer do snowshoes look like a modified tennis rackets, they are high tech plastic contraptions, which make trudging in the wilds a pleasure. Dressed for the snowshoe walk. 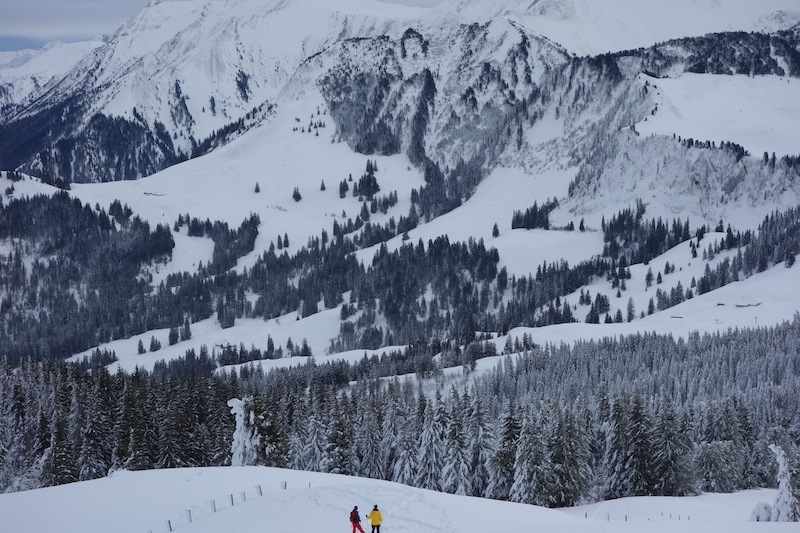 Immense is the word to describe the alpine wilds near Bern. Bev and I having a ‘blow’. A ‘blow’ means to take a rest. The phrase comes from the days when people travelling in a convertible car went out for a weekend picnic (rest) in the English countryside. Naturally their hair blew on the way so having a ‘blow’ meant going out for the day for picnic and rest. 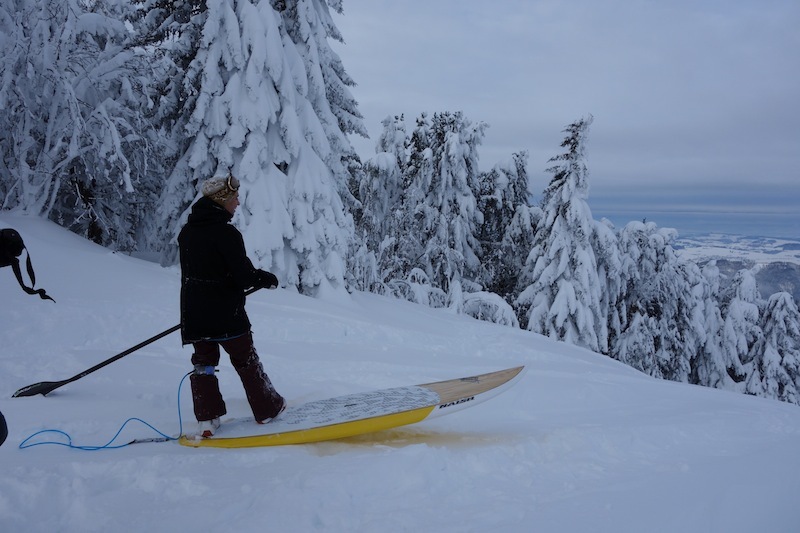 This dude lugged his surfboard to the top of the mountain and is about to plunge headlong down. I’m thinking about how good this spot would be for an overnight camp. Bev with our Swiss ‘daughter’ Rahel, and her father Peter. AROUND THE CITY OF BERN. 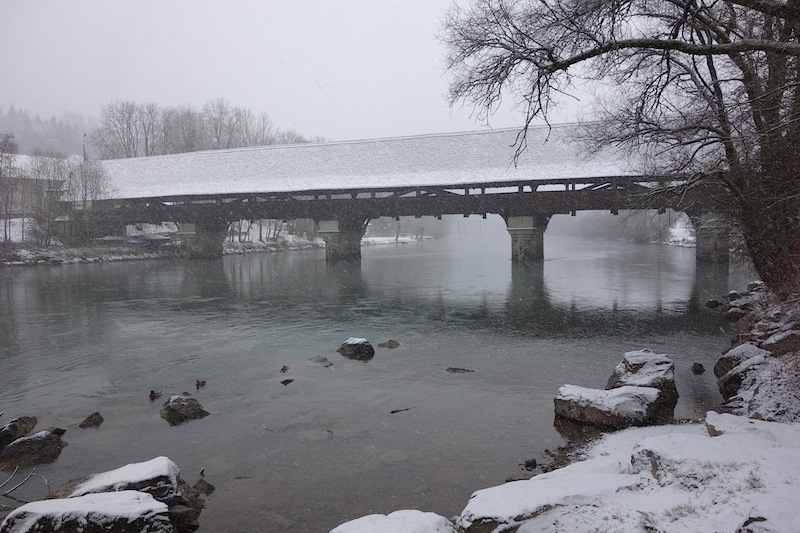 Our base was at Bremgarten on the Aare River not far from the city of Bern. Transport to the city was easy, regular suburban buses which connected to trains or city-bound buses. There were heavy snowfalls in early December but by the end of the month the snow had melted and all had returned to green fields and, best of all, no slush underfoot! 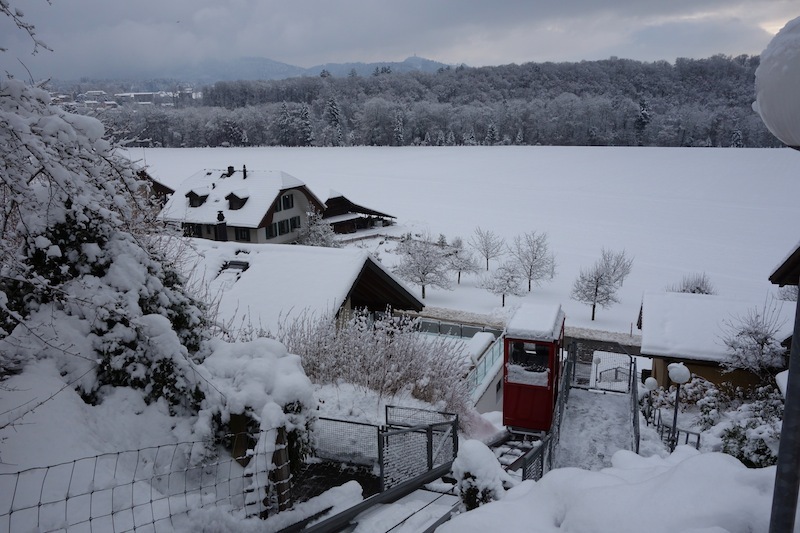 View from our Bremgarten house with snow. A small cablecar takes residents of the area up and down. 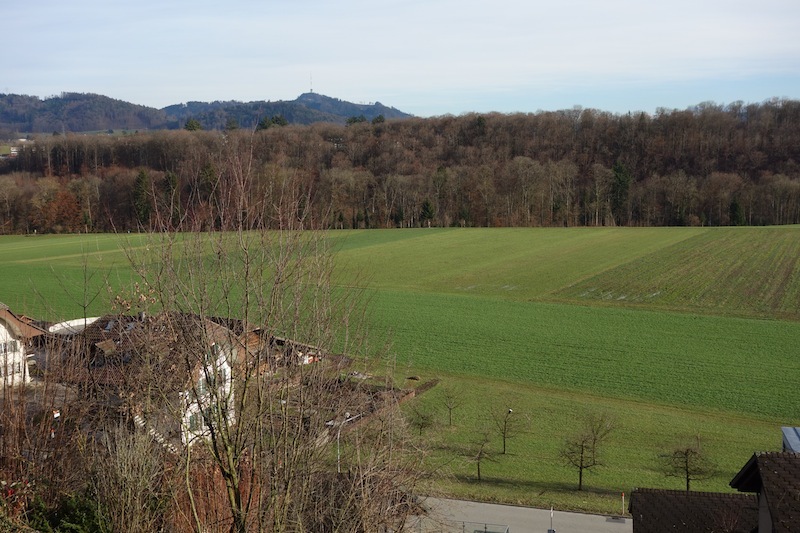 View from our Bremgarten house after the snow melt. 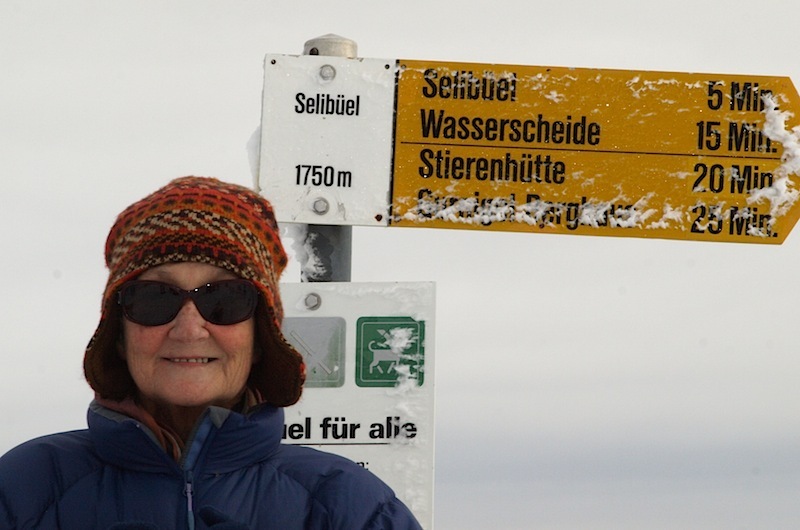 The Swiss are avid walkers regardless of the weather. 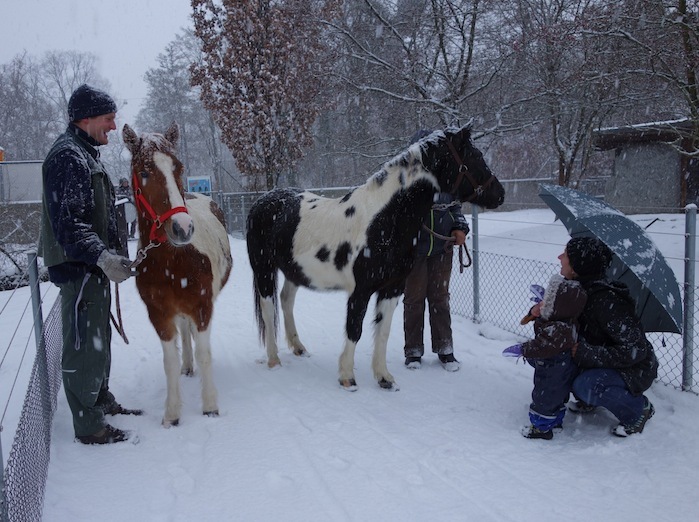 Children, however young, are bundled into their snow or rain gear and taken out for some fresh air. 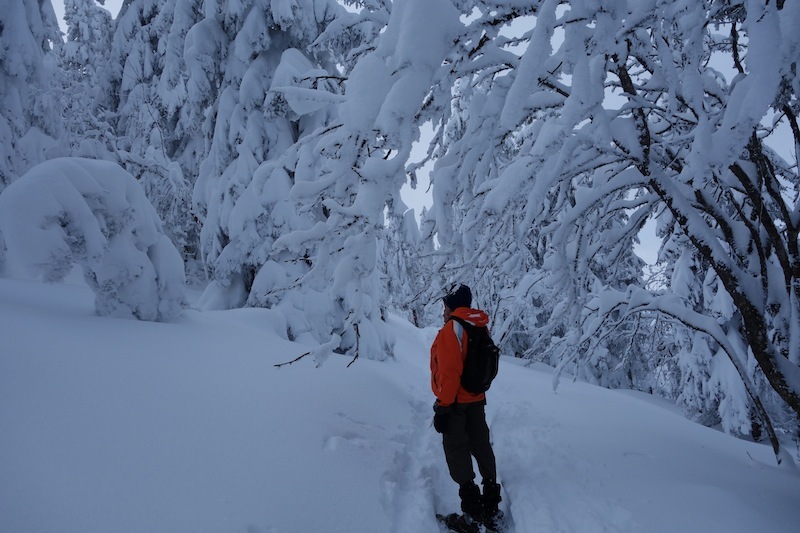 A heavy snowfall while out walking. The daily walk across the fields and along the river. 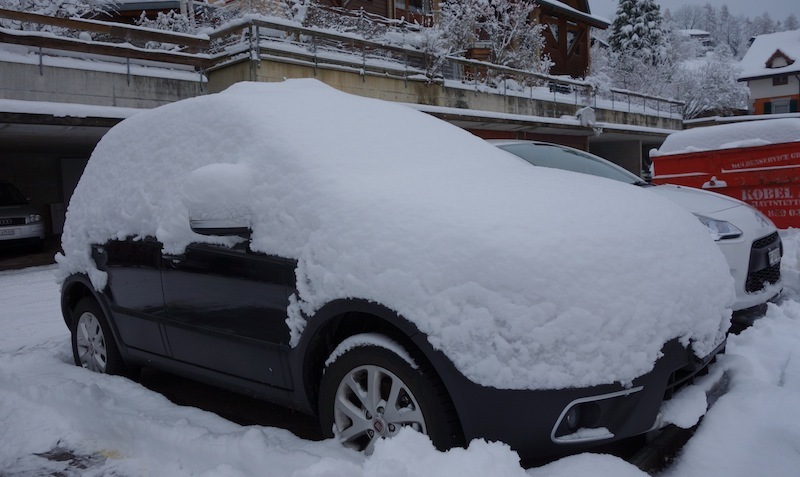 Our hire car on the day we left for France. 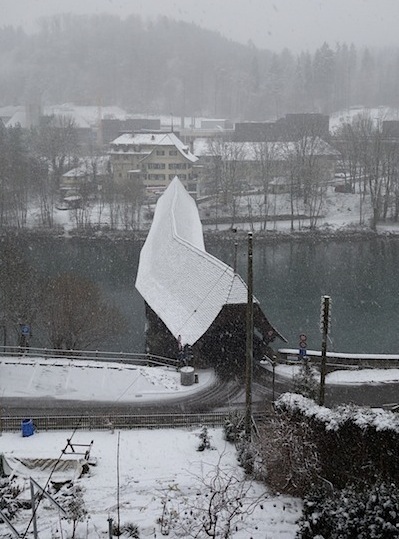 Covered bridge across the Aare River near Bremgarten. The Aare is the longest wholly Swiss river. 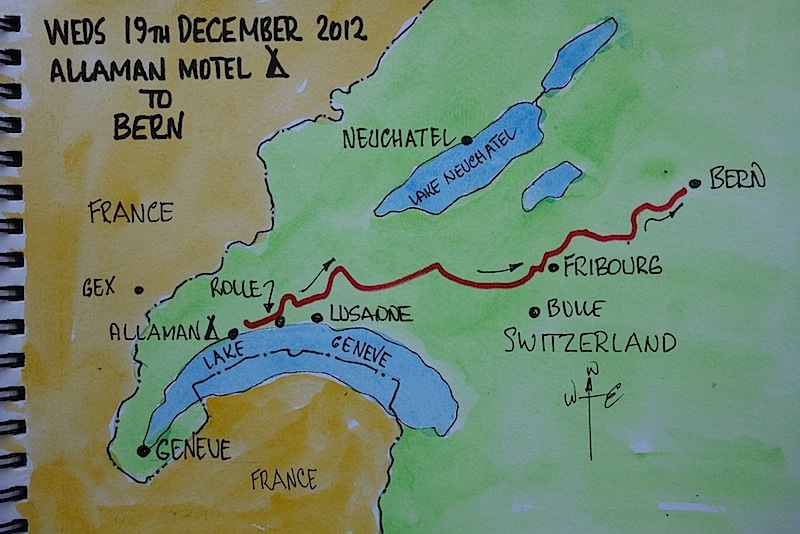 It originates in the eastern Bernese Alps, flows through lakes Brienz and Thun, passes by Bern, is channelled into Lake Biel, follows by the southern foot of the Jura range and finally flows into the Rhine at Koblenz in north-western Switzerland. 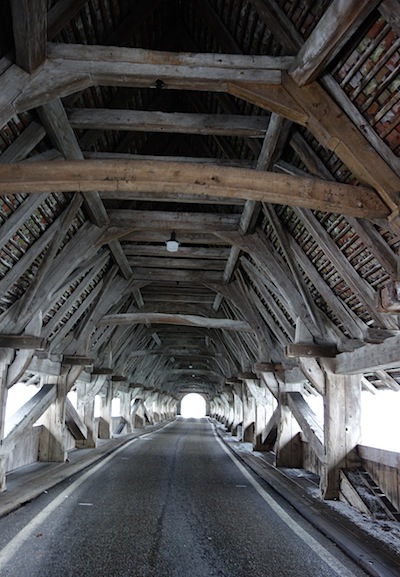 Inside the covered roadway (bridge) across the Aare. 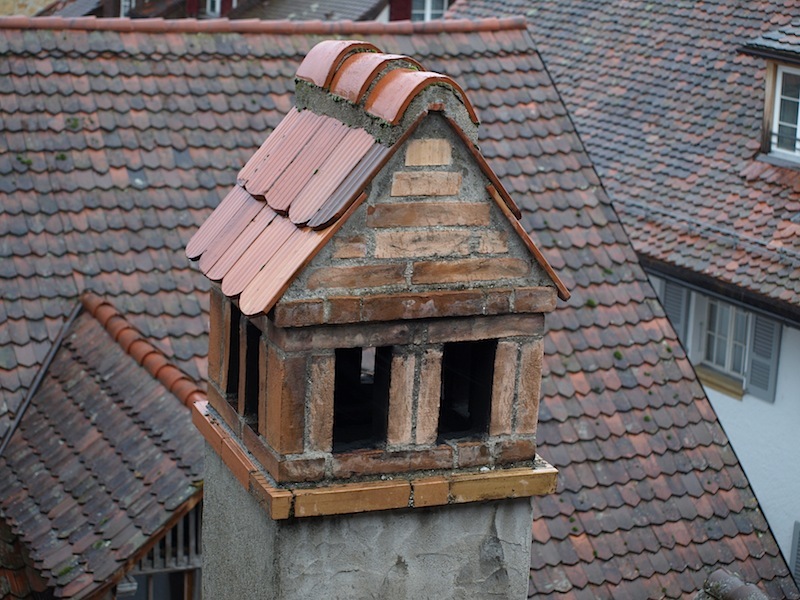 The purpose of the roof is to protect the wooden structural members from the weather. 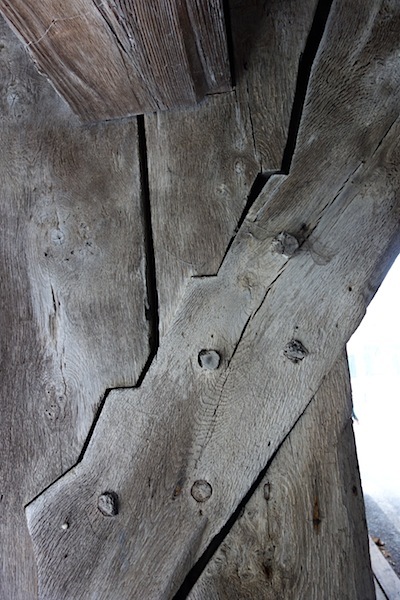 Uncovered wooden bridges have a life span of only 10 to 15 years because of the effects of rain and sun. Bridges having covers also provided a place for pedestrians to weather a storm. Detail on the covered bridge. I would call this a ‘Y’ half cross lap joint. 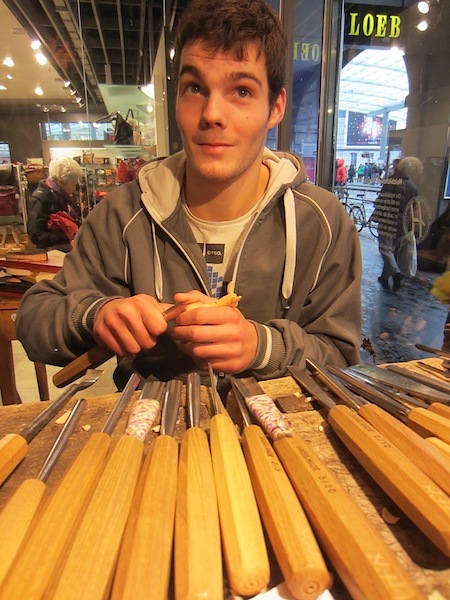 There are no metal fixers to hold the joint together, just simple wooden pegs. In woodwork, fixing a lap joint is a technique of joining two pieces of material together by overlapping them. A lap may be a full lap or half lap. A VISIT TO THE NATIONAL PARLIAMENT. Our friend Peter took us to a sitting of the national parliament. Order and decorum seemed to be the order of the day; very different to the arguing and ‘mud slinging’ as happens in Australia. It was so refreshing to see harmony. I daresay there are disagreements at times but it wasn’t today. Of particular interest was the fact that speakers spoke in a number of languages. German, French, Italian and Romansh are the four national languages traditionally spoken in different regions of the country. A front view of the Bundeshaus, the Swiss Parliament. 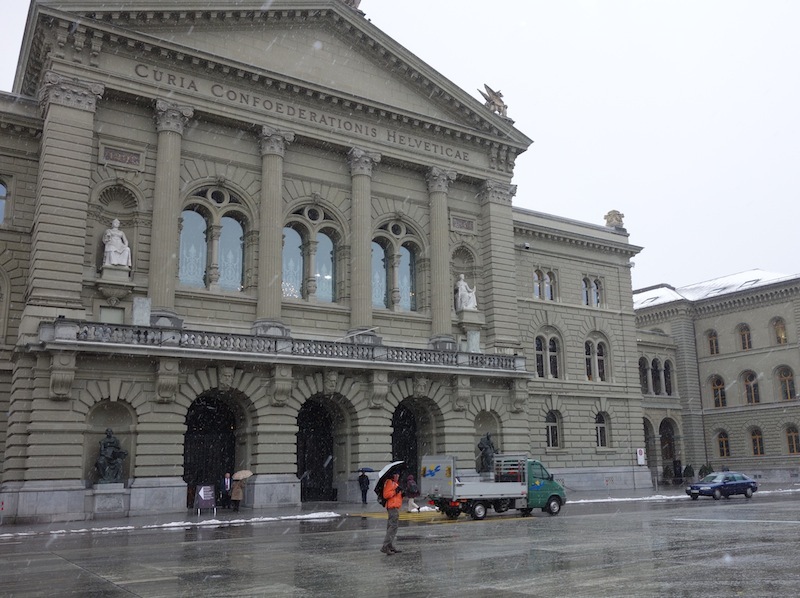 Switzerland’s official name is the “Swiss Confederation” and is a federal democracy with a president at its head. It is sometimes referred to as Helvetia which relates to the several Celtic tribes who occupied the Swiss plateau, the most important of them were the Helvetians settling the region from about 500 B.C. to A.D. 400. The Helvetians knew how to organize work in pre-industrial manufactories. Celtic carts and wagons were superior to Greek and Roman ones. In addition the Helvetians were skilled craftsmen, had highly developed technology in metal-working and a sense of style. Modern Swiss have refined their cultural-style inheritance and that is why ‘good enough for the bush’ as sometimes is the case in Australia, doesn’t exist. At the rear of the Bundeshaus. Snow is nice stuff. I asked Peter if he knew what percentage of water is in snow, he wasn’t real sure so we did a test and it turns out at around 10%. Switzerland is the world’s richest nation by GDP – gross domestic product – has the lowest rate of taxation in the Western World, has the lowest rate of home ownership in Europe – only 37% of it’s population own their own home – and has the lowest unemployment rate in Europe, with just 2.8% of the population out of work . Switzerland is not a member of the European Union preferring to ‘go it alone’ which in light of the present Euro financial crisis their decision not to join might have been a good idea. Every society, no matter how wealthy, has its beggars and eccentrics. This man appeared to be performing some sort of penance, however the odd passer by dropped money in his hands. 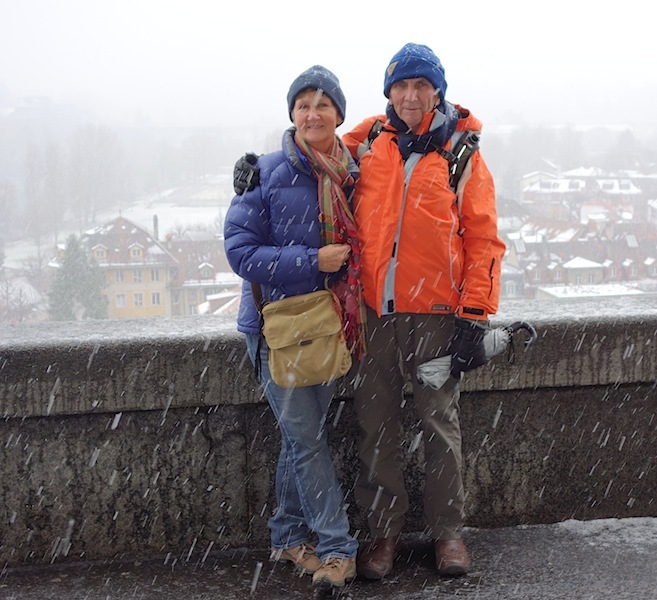 A VISIT TO BERN MUNSTER. The first place of worship on the Munster site was probably a small chapel, built around the time Bern was founded (1191). Its existence is first recorded in 1224. In March 1421, master builder Matthäus Ensinger began construction on a monumental new cathedral to take the chapel’s place. Originally from Strasbourg, Ensinger had already built three other cathedrals. The huge new munster/church could accommodate large numbers of worshippers, yet only 5,000 people lived in Bern at the time. 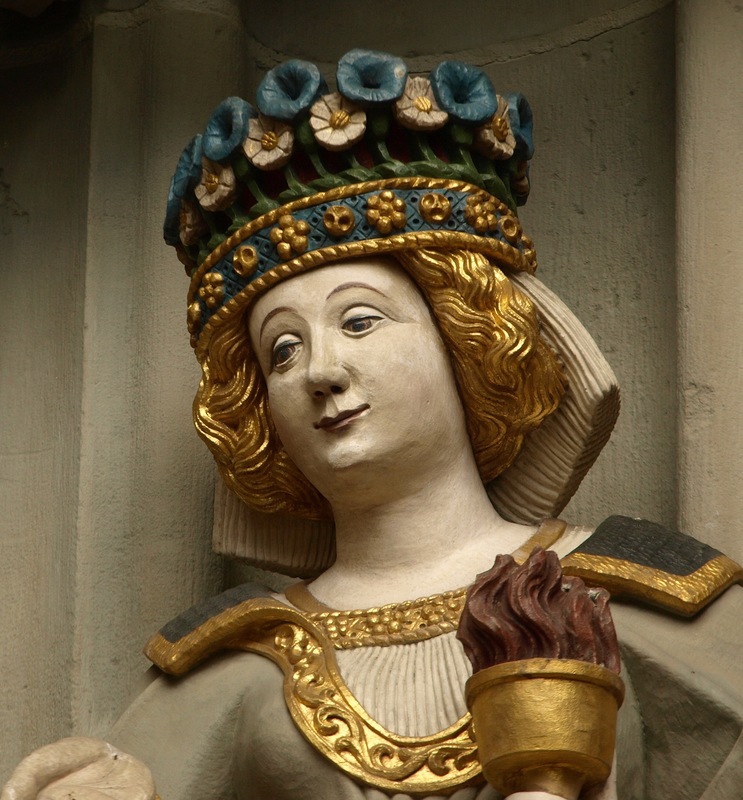 Work continued on the Münster, using local sandstone, for over a century. It was not fully completed until 1893, when the bell tower was added. In the meantime, Bern had become Protestant and the Berner Dom (cathedral) was now the Berner Münster (collegiate church). 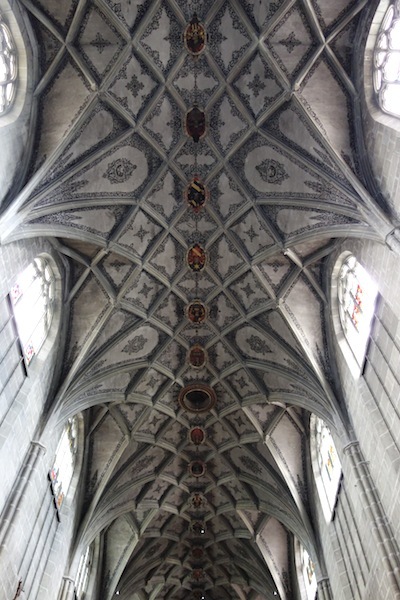 The immense interior of the Münster features lacy ceiling vaults (1572-73), a long nave with diagonally-placed square pillars, and two side aisles flanked by small chapels. As part of its conversion for Protestant use, the side chapels now contain pews instead of altars. Windows in the church date from 1441-50. 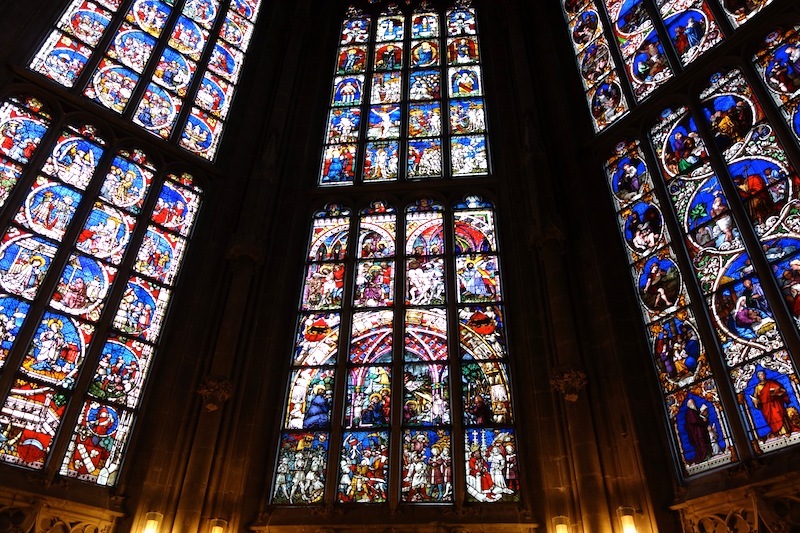 The most remarkable window in Bern Münster is the ‘Dance of Death’. It was a lesson on the inevitability and equality of death, grinning skeletons dance across the glass while harassing people from all walks of life. I have mentioned previously that in centuries past the masses were basically illiterate so for religious leaders to get their message across they used symbolic representations, such as the ‘Dance of Death’ window. 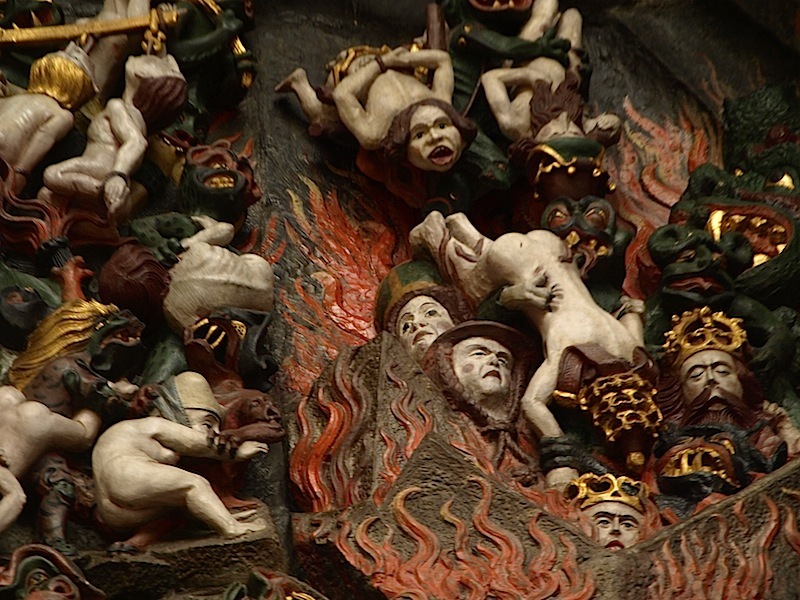 The following photographs of the Last Judgement in the portal of the Munster show symbolism at its very best. The portal sculpture contains more than 200 carved wood and stone figures. 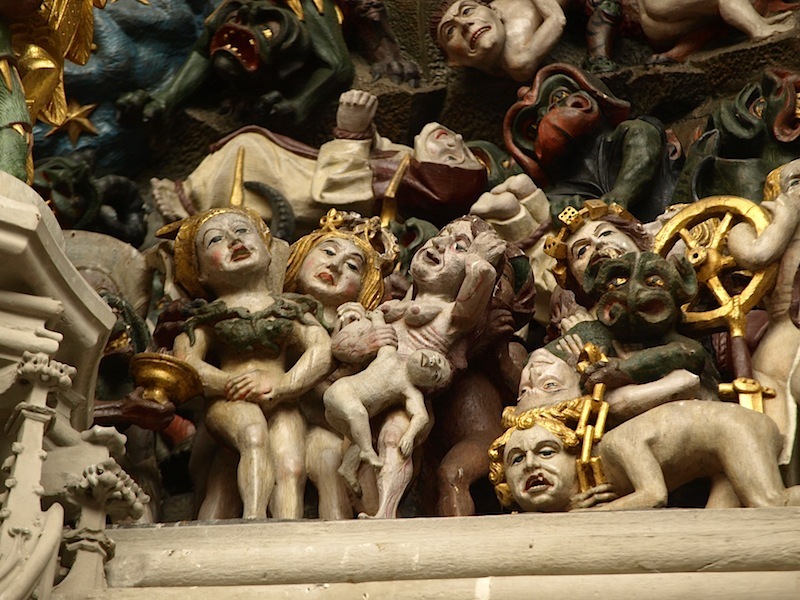 Such a large collection of late-Gothic sculpture is a rare survival in Europe. 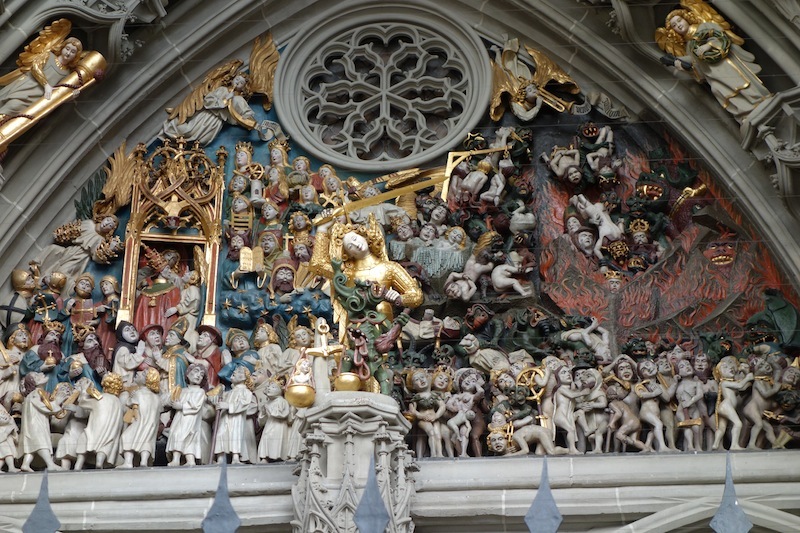 The 170 smaller figures are 15th-century originals and the 47 larger freestanding statues are replicas (originals in the Bern Historical Museum). Heaven and Hell. The choice is simple….if you believe you will go to Heaven (left), if you don’t you go to Hell (right). Justice in the centre is flanked by angels and the Wise and Foolish Virgins. The story about the wise and foolish Virgins relates to a parable told by Jesus but I’m not going there as it’s too unbelievable for my simple mind. If you are interested go to the web. Sinners being thrown into the fires of Hell. 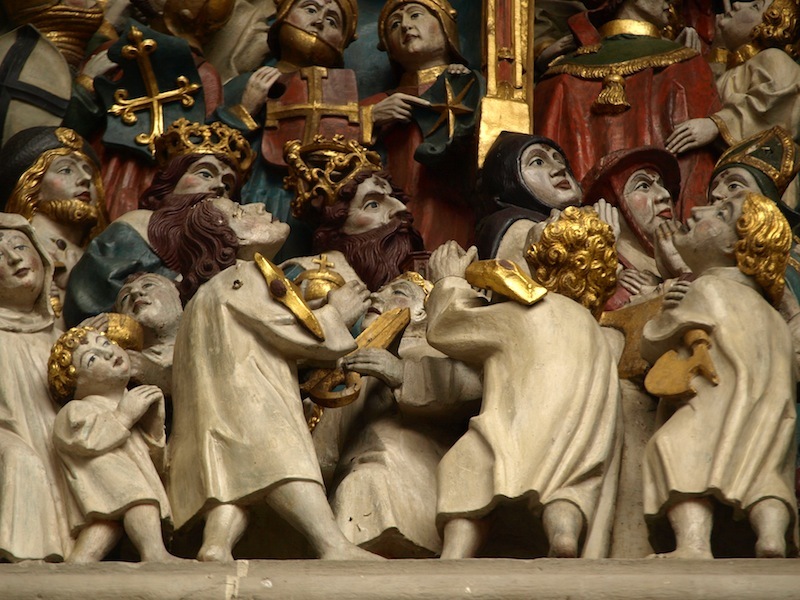 Maybe the crowned figures are the corrupt kings and despots of centuries past. Shackled and chained in Hell for eternity. Salvation in Heaven. The Heaven side looks like the best option in the afterlife. Clothed and clean and no hellfire. Don’t panic, there is room for all if you believe! One of the many stone figures in the portal. 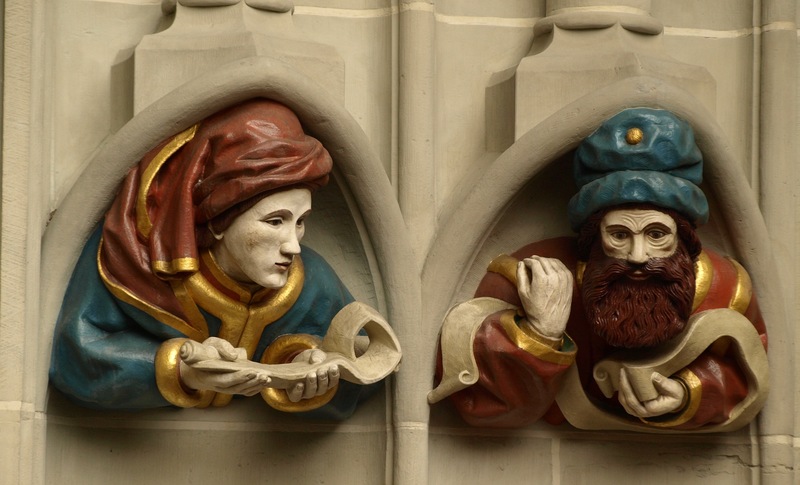 After seeing the figures in the portal I wondered if there were any wood sculptors in Bern these days. We found one whittling away in a coffee shop. Modern day sculptor carving a donkey with his tools of trade laid out in front of him. Murten is a fascinating and beautiful walled town situated between Bern and Lausanne and is the capital of the Lake District of the canton of Fribourg. 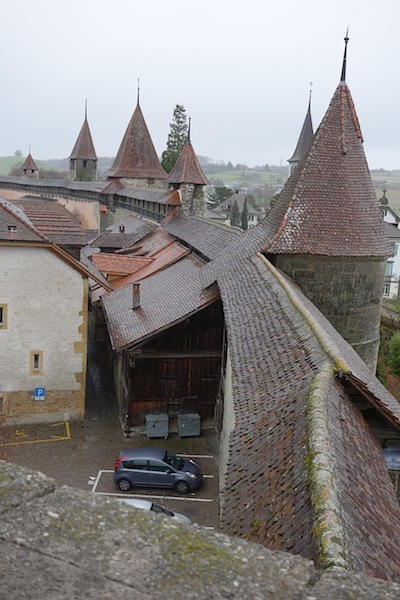 This small medieval walled town lies in the Swiss “Midlands” on the edge of the Great Marsh. The oldest archaeological traces of a settlement around Murten are from the Mesolithic (8200-5500 BC) period. Backyard view from the town wall. Covered wall walk surrounding the town. 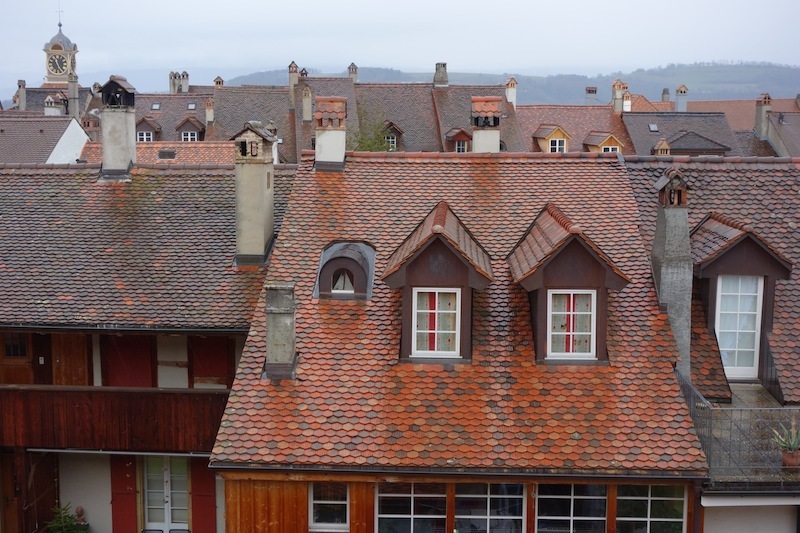 Chimneys and glazed tile roofs are the feature of houses in Murten. 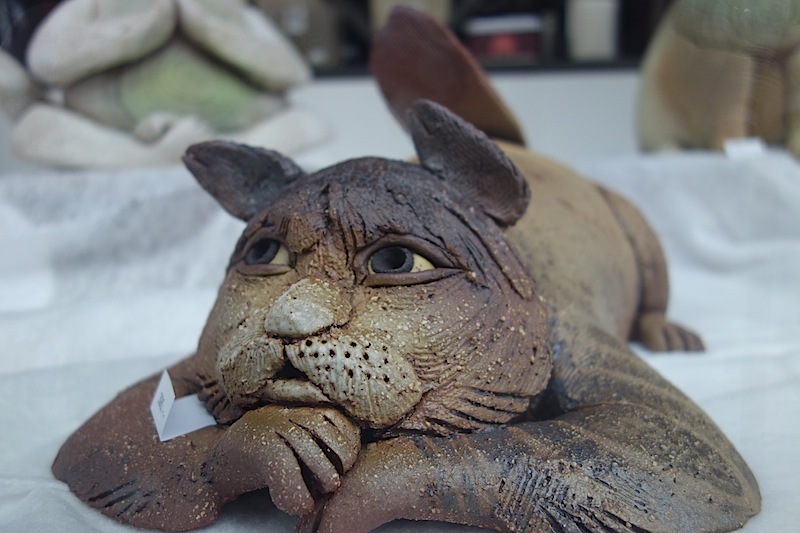 Wandering the laneways of Murten we came across a shop devoted to anything to do with cats. There was work from a ceramicist, Shoshana Kneubuehl, (www.shoshana-kneubuehl.ch) and being one myself I was immediately attracted to her work. Unfortunately, being Sunday and New Year’s Day, the gallery was closed but Bev was able to get a few photographs through the window. 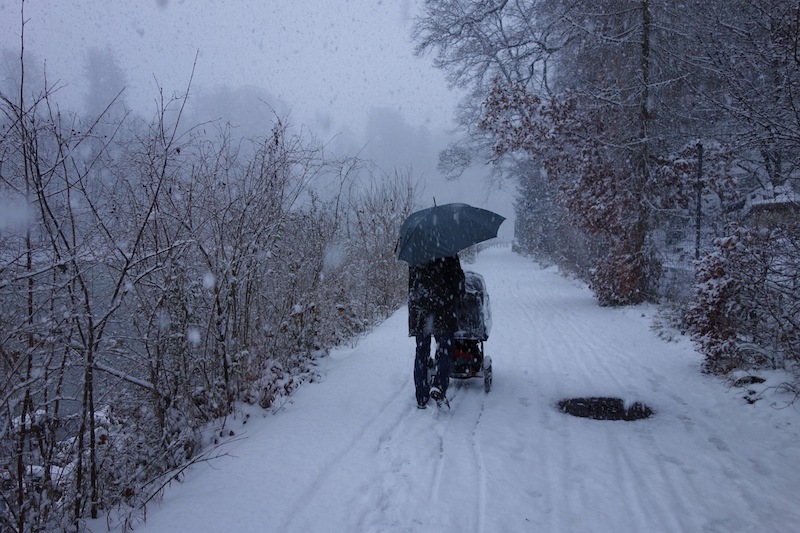 Sundays in Switzerland are sacrosanct to most. It is considered impolite to do many outdoor activities like cutting the grass, gardening, hanging out the washing and any noisy activity that may annoy your neighbour. Unfortunately the ‘do no work on Sundays’ means many shops do not open. 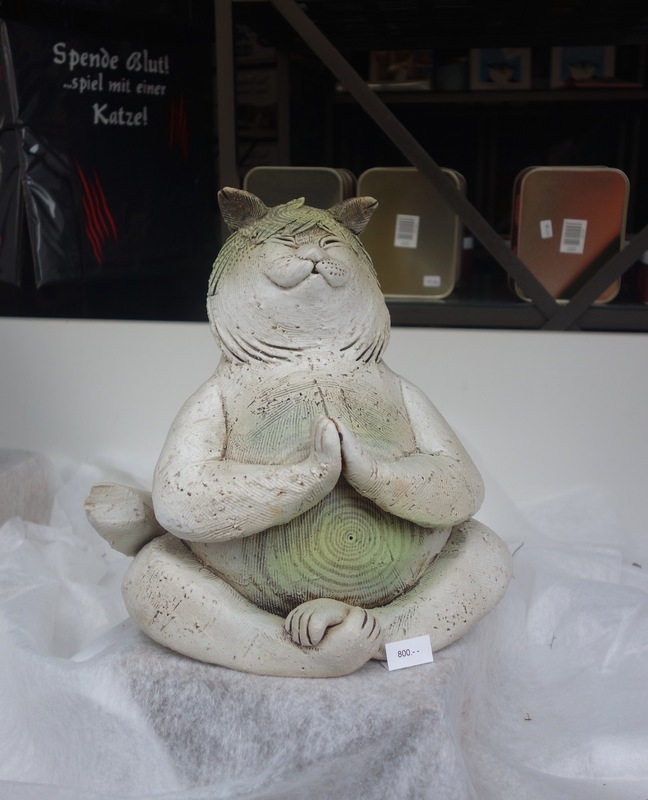 Meditating cat. The concentric circles may relate to the ‘concentric circle chaos’ theory. Another cat, in relaxation mode. 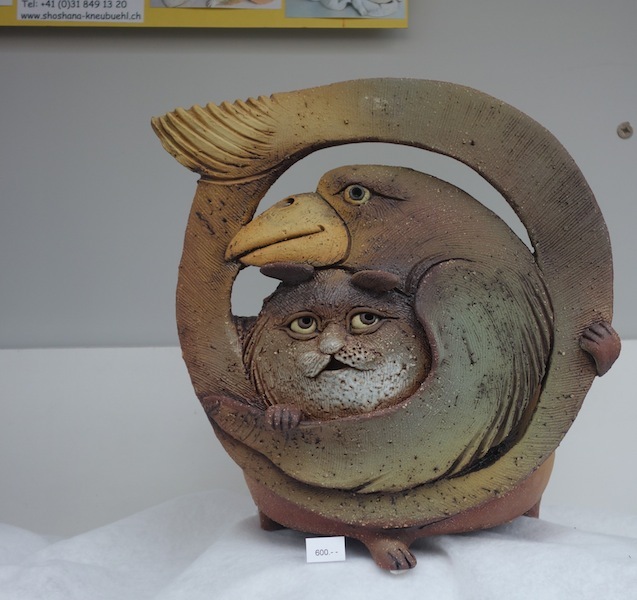 Cat caught by a bird or bird caught by cat. 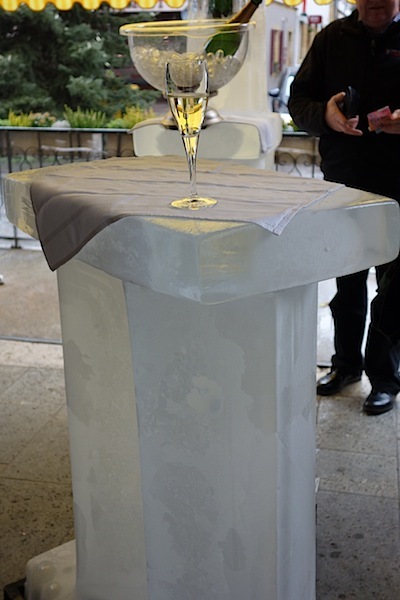 A table made from ice outside a café. 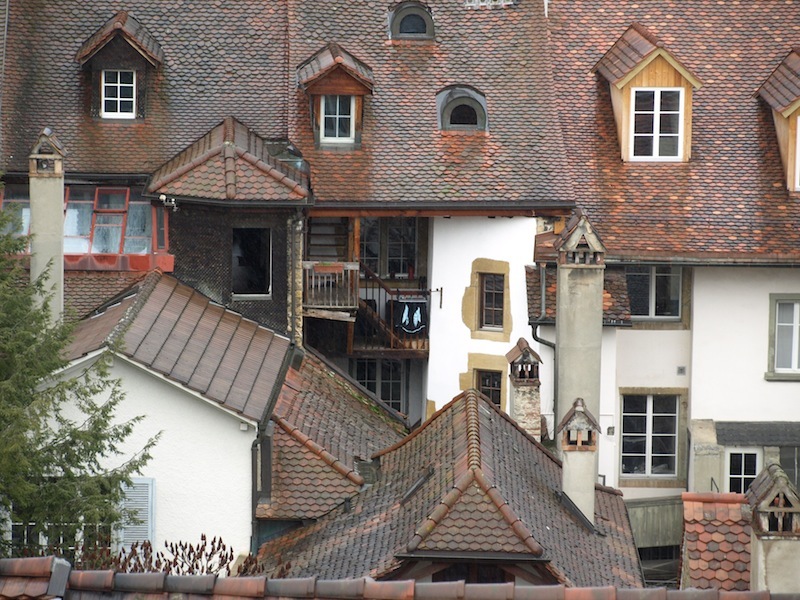 Bern and its surrounds is a delightful and picturesque area. There is much to explore and experience. Definitely a city worth putting on the ‘must do’ list.